By making a reservation with us, and providing a credit card number or making a payment, you agree that you will pay the amount of your stay in full prior to your arrival date. All funds received prior to cancellation are non-refundable, and upon cancellation any remaining balance on the reservation are due in full. All funds remain non-refundable unless we can re-book the cancelled dates. If we re-book all of the cancelled dates, any funds paid will be refunded via a company check minus a $300 administration fee. Transfers are commonly treated the same as cancellations however exceptions may be made with a $75 transfer fee. The Processing Fee collected at the time of booking is not refundable in any circumstance. To confirm your reservation we require 50% of the total cost of the vacation if your arrival date is more than 30 days in the future. The full balance is then due 30 days prior to your arrival date. Reservations that are made within 30 days prior to arrival must be paid in full. You may pay this balance by Visa, MasterCard, or Discover. All payments must be made in U.S. funds. A $25.00 late fee will be added to your balance if it is not paid in full by 30 days prior to arrival. Rates and fees are updated regularly to reflect the most current and accurate charges on property listings and the online booking system. However, Lake Michigan Cottages reserves the right to adjust charges to the proper amounts after an online booking in the event of a clerical or technical error. By clicking the box below, you are agreeing to the full Terms & Conditions of your stay found in our rental agreement which you can view by clicking here. 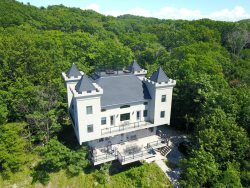 You will receive an email containing a copy of the full rental agreement upon making this reservation which you will need to sign and return to Lake Michigan Cottages within 7 days of making this reservation. Lake Michigan Cottages is authorized to rent to FAMILY groups only age 25 or older, and to only allow the maximum number of guests as stated on the website as "sleeps" or "occupancy". Exceeding this number is not allowed and a violation is subject to immediate eviction. Campers, RV's, tents, and any other method of increasing the occupancy is strictly prohibited on the property. If you are bringing an RV or camper, please contact Lake Michigan Cottages for storage options during you stay. Lake Michigan Cottages strongly recommends you protect your vacation investment by purchasing our Vacation Rental Insurance Plan. We offer CSA Travel Protection, and your policy can be purchased at the time of your booking. For additional information regarding purchasing travel insurance please click here or call our office. Lake Michigan Cottages shall not be liable for events beyond their control which may interfere with your occupancy of the property such as weather, acts of governmental agencies, fires, strikes, war, inclement weather, or acts of God that cause service interruption or a power outage. No refunds shall be given for such occurrences and you are encouraged to obtain trip interruption or vacation rental insurance to cover such risks. If State or local authorities order a mandatory evacuation of an area that includes the subject property, you will comply with the order. You will not be entitled to any refund if you have not purchased trip or vacation rental insurance offered through our recommended carrier. Once insurance is purchased, it is non-refundable. We understand the desire to bring a pet on vacation with you; therefore a select few of our vacation rentals will allow pets to stay with you. Please view our website to see the properties that will accept pets. For properties that are listed as “pet friendly” you are allowed to bring one (1) dog with an additional fee and pet agreement. You can view the pet agreement here. Restrictions and guidelines will apply.